The amazing Hanging Bridge of Cadiz, Spain. White elephant, or desperately needed to relieve traffic through Spain’s oldest city? Hard to say. 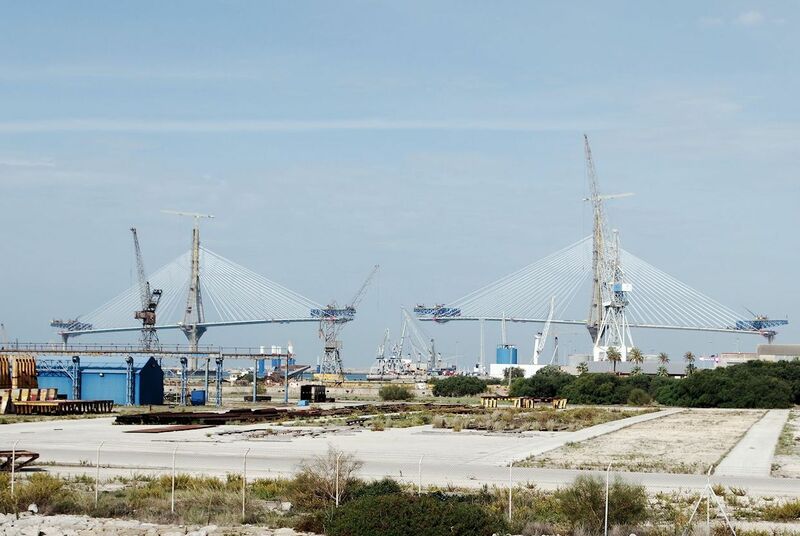 Is the spectacular new bridge across Cadiz Bay a white-elephant-in-waiting? A recent visit leaves us in two minds. Puente de la Pepa, Cadiz, October 2014. Photo @DriveEurope. The under-construction bridge out to the island city of Cadiz in Spain has become a symbol of both the massive overruns typical of big infrastructure projects and wasteful EU spending and corruption. Actually, Puente de la Pepa is being paid for by the state but that hasn’t stopped the still unfinished, 5km long drawbridge – at 69m the highest in Europe – becoming the focus of a campaign to highlight ‘abusive’ redevelopment in Spain’s oldest city. Andalusia, the southernmost Spanish province in which Cadiz sits, has reportedly sucked up €14bn in EU aid over the past seven years with apparently little to show for it. Magdalena Álvarez Arza, the local minister of public works who signed the La Pepa contract in 2006, left her subsequent job as Vice-President at the European Investment Bank in June. A statement from the EIB president said, ‘I sincerely hope that the ongoing investigation proceedings will lead to a positive outcome for her’. The EIB has loaned Andalusia €6.7bn since 2004. According to Der Spiegel she personally posted a €30m bond to escape pre-trial detention. She denies all charges. Meanwhile, the cost of the bridge has spiraled from an initial €288m to a current €506m and there is no end in sight. Work has been carried out in fits and starts with the most recent revival in early October. There are also obvious doubts over whether the new bridge is needed at all. The 6km long island, population 123,000, is already connected to the mainland by the four lane 1.3km Carranza Bridge, and the dual carriageway CA-33 along an isthmus in the south. La Pepe, across the north part of Cadiz Bay, is designed to relieve return traffic through the city, and serve a brand new, also under-construction half-kilometer-long quayside for cargo ships. Since the 9 March 2014 edition of Top Gear it has become fashionable to criticise underused EU-funded infrastructure in Spain. In our recent experience however there is generally plenty of traffic on the roads. We missed a closer look at the country’s most historic old town after being stuck too long in a jam on Carranza Bridge. 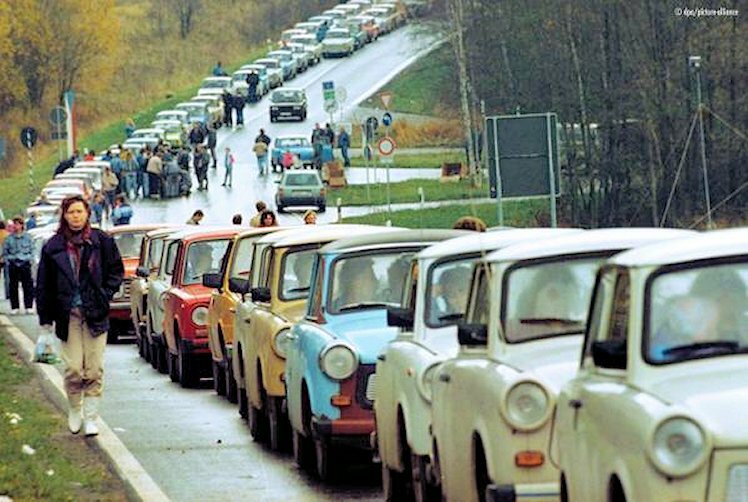 Twenty five years ago today: gaps start to open in the previous almost impregnable Iron Curtain – from Stettin (Sczcecin) in the Baltic to Trieste in the Adriatic – and immediately queues of Trabbies begin to form, many of them summarily abandoned on the other side. More later.